The challenge for any governor’s inaugural speech--particularly a second one –is negotiating the thin line between profundity and banality. Platitudes are inevitable on such ceremonial occasions, when pomposity threatens to override pomp. So it was for Rhode Island Gov. 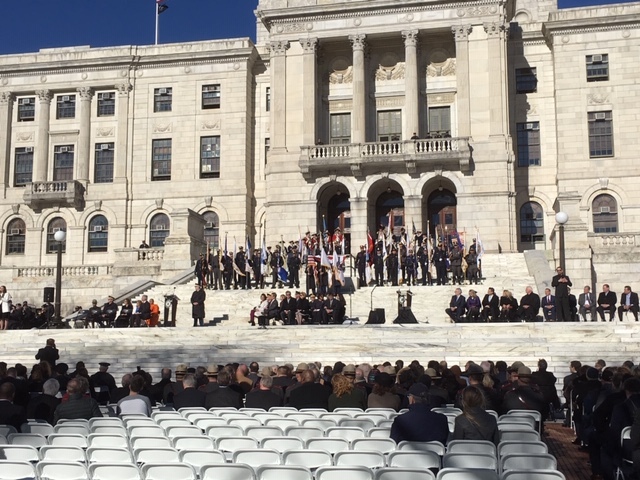 Gina Raimondo’s second inaugural, delivered into a wind that riffled flags under a balmy-for-January New England afternoon that was in sharp relief to shivering day the state’s first woman governor was sworn in back in 2015. Fresh off an impressive November victory, Raimondo’s hopeful, upbeat address today sounded much like a campaign kickoff, sans the partisan shots. Raimondo’s narrative is familiar –that her administration has had success in improving Rhode Island’s economy during her first term and now must focus on Rhode Islanders who have not flourished in this time of low unemployment and increased job opportunities. Then she quickly pivoted to what is emerging as the theme of her second term – to extend opportunity to all and combating social ills. She mentioned the scourge of opioid addiction, the need for a better state education system and dealing with climate change. Yet, on a day scripted for an upbeat message, Democrat Raimondo didn’t point the finger of blame at the divider-in-chief Republican sitting in the Oval Office. It was a short speech of about twenty minutes, which was also a contrast with her first inaugural address of about a half hour. Along with the campaign-style recounting of her administration’s successes and second-term challenges, the governor launched into a sermon befitting a clergy member. “It’s time for us to adhere to Rhode Island’s founding principles of inclusion, equality and tolerance. We believe that all people deserve to be treated with respect and dignity no matter what your race, religion, gender, ethnicity, who you love or where you come from. Let’s find the courage to bring to the table perspectives that have been missing,” she said. The recent round of dismal standardized test scores for most Rhode Island public schools wasn’t mentioned, naturally. While the gun lobby is vigorous at the Statehouse, Raimondo is aware that public opinion in Rhode Island and other southern New England states favor reasonable gun restrictions. The more contentious parts of her second-term plans will wait for her budget address, scheduled for delivery to the General Assembly at a Statehouse joint session on January 17. That’s when the constraints of the state budget inject a stern reality into the flowery rhetoric of progress and new spending programs. Many at the capitol believe schools need more support, but there is little will to raise taxes to accomplish this. In was a day of continuity, rather than change at the Statehouse. Only one general officer being sworn in was new --Attorney General Peter Neronha. All the other statewide elected officials were sworn in to second terms: Lt. Gov. Dan McKee, Secretary of State Nellie Gorbea and General Treasurer Seth Magaziner. The governor ended on a let’s go high note, echoing Michelle Obama, the former First Lady who now is author of the nation’s best-selling book. In a treacly tribute to Rhode Island, Raimondo rolled out the cliché that the state’s size can be a strength. It was a shout-out to the belief that a state as cozy as Rhode Island can-- better than our larger neighbors—put in one room the crucial decision-makers in business, politics, education and the non-profit worlds . The problem is that too often they don’t very much like each other and don’t feel it is their interest to cooperate for the common good. Banality or profundity? There was much of both. But this Rhode Islanders should ponder on the first day of a new year and a second Raimondo administration: Whether you love her or not, whether you voted for her or not, her fate and ours are at this moment linked.